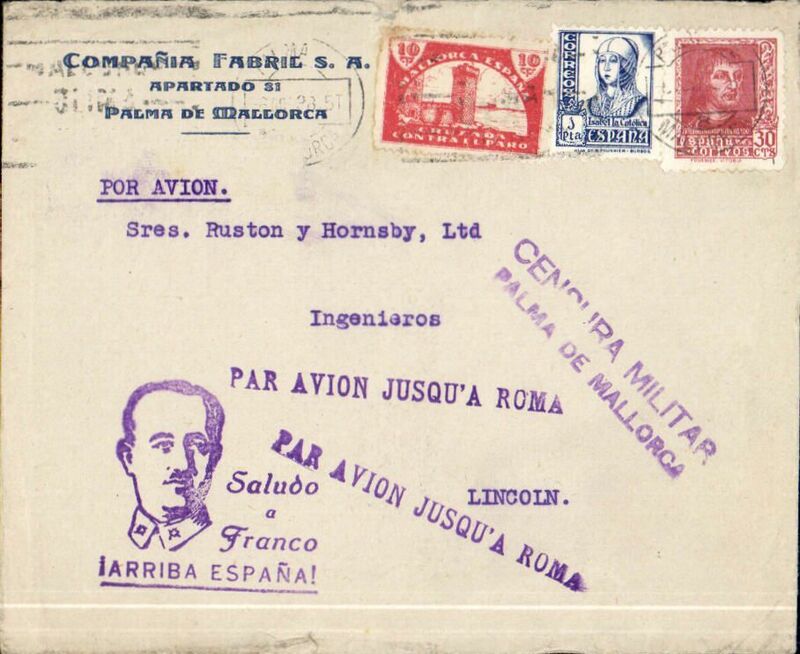 Front only, Censored Spanish Civil War airmail, Palma Majorca to London, no arrival ds, commercial corner plain cover franked 1P35 (foreign letter rate 50c, air fee to Rome 75c, unemployment tax 10c), canc La Puebla cds, fine strike scarce red "Par Avion Jusqu'a Roma" with umlaut over the 'A', uncommon black two line "Censura Militar/La Puebla" censor mark, typed "Por Avion Via Roma" instruction. Great Britain had no official postal relationship with the Nationalist (Franco) government and, hence, with Palma de Mallorca. But those in the know used the Italian Ala Littoria seaplane Cadiz-Mellila-Mallorca-Rome airmail route serving Nationalist areas of Spain. 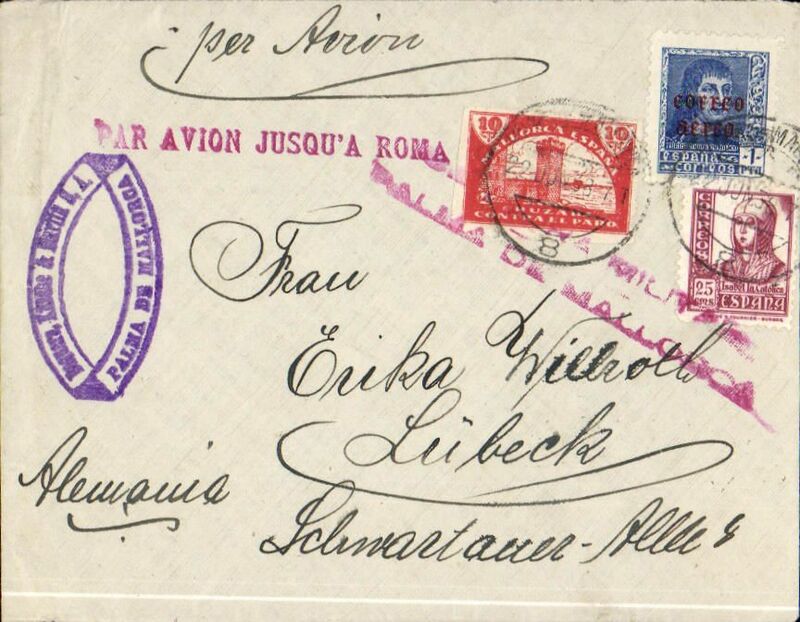 Censored Spanish Civil War airmail, Palma Majorca to Berlin, no arrival ds, plain cover franked 1P35 (foreign letter rate 50c, air fee to Rome 75c, unemployment tax 10c), canc Palma de Mallorca cds, fine strike red uncommon "Par Avion Jusqu'a Roma" applied in Palma, violet two line "Censura Militar/Palma de Mallorca" censor mark. 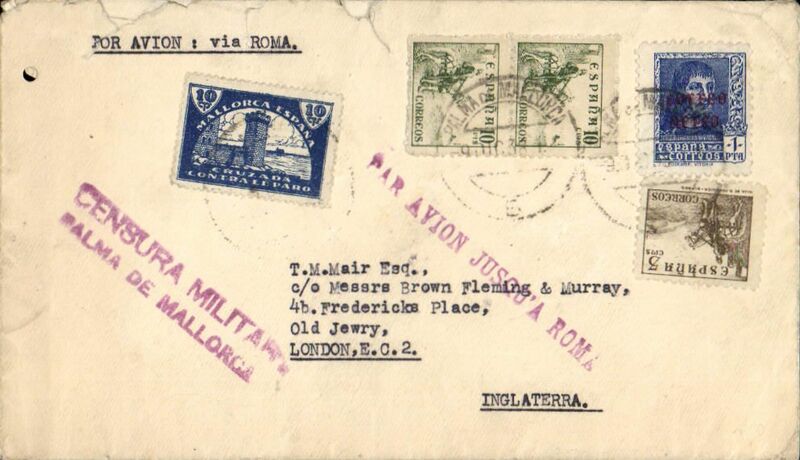 Ms sender's direction "Hasta Roma/par avion Italia" - for carriage by the Ala Littoria Cadiz-Mellila-Mallorca-Rome airmail route serving Nationalist areas of Spain. 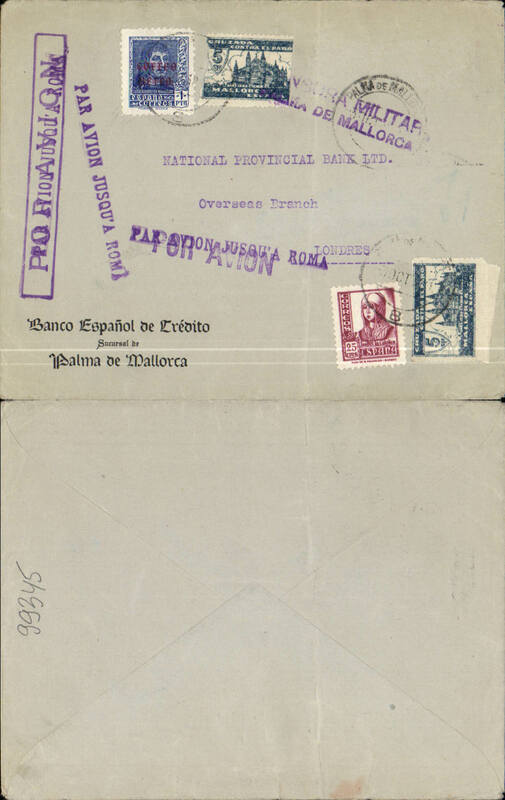 Censored Spanish Civil War airmail, Palma Majorca to Germany, no arrival ds, plain cover franked 1P35 (foreign letter rate 50c, air fee to Rome 75c, unemployment tax 10c), canc Palma de Mallorca cds, red "Par Avion Jusqu'a Roma" applied in Palma, violet two line "Censura Militar/Palma de Mallorca" censor mark, black trilingual Franco slogan hs. Carried on the Ala Littoria Cadiz-Mellila-Mallorca-Rome airmail route serving Nationalist areas of Spain. Nice item. 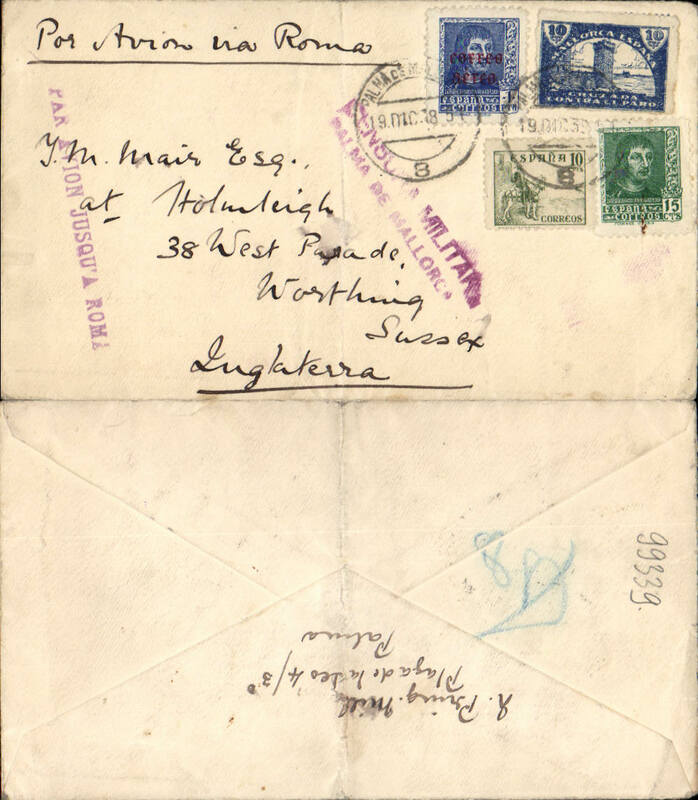 Censored Spanish Civil War airmail, Palma Majorca to London, no arrival ds, commercial corner plain cover franked 1P35 (foreign letter rate 50c, air fee to Rome 75c, unemployment tax 10c), canc Palma de Mallorca cds, fine strike uncommon purple "Par Avion Jusqu'a Roma" applied in Palma, purple two line "Censura Militar/Palma de Mallorca" censor mark, typed "Por Avion Hasta Italia" instruction. Great Britain had no official postal relationship with the Nationalist (Franco) government and, hence, with Palma de Mallorca. But those in the know used the Italian Ala Littoria seaplane Cadiz-Mellila-Mallorca-Rome airmail route serving Nationalist areas of Spain. 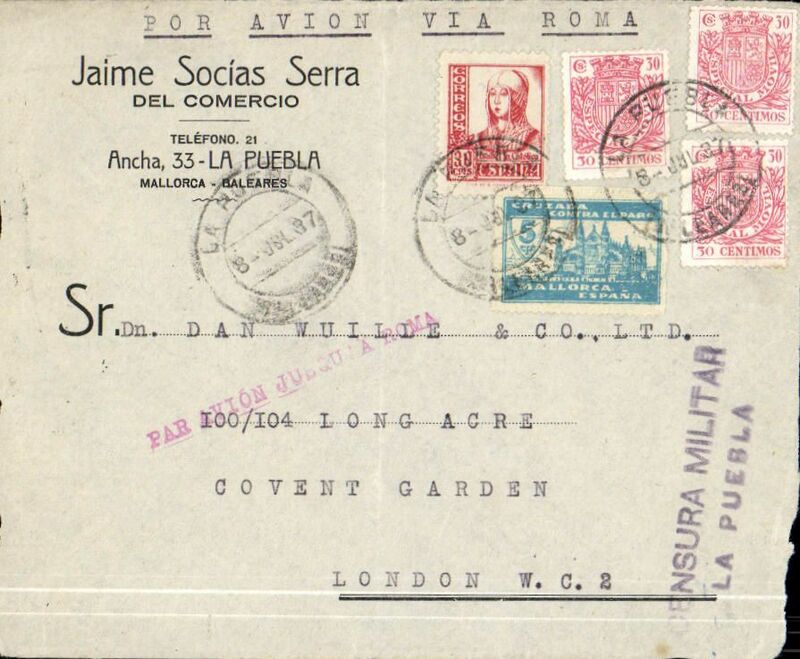 Front only, Censored Spanish Civil War airmail, Palma Majorca to London, no arrival ds, commercial corner cover franked 1P35 (foreign letter rate 50c, air fee to Rome 75c, unemployment tax 10c), canc Palma de Mallorca cds, fine strike red "Par Avion Jusqu'a Roma" x3, red two line "Censura Militar/Pama de Mallorca" censor mark. Great Britain had no official postal relationship with the Nationalist (Franco) government and, hence, with Palma de Mallorca. But those in the know used the Italian Ala Littoria seaplane Cadiz-Mellila-Mallorca-Rome airmail route serving Nationalist areas of Spain. Small lower rh corner defect. 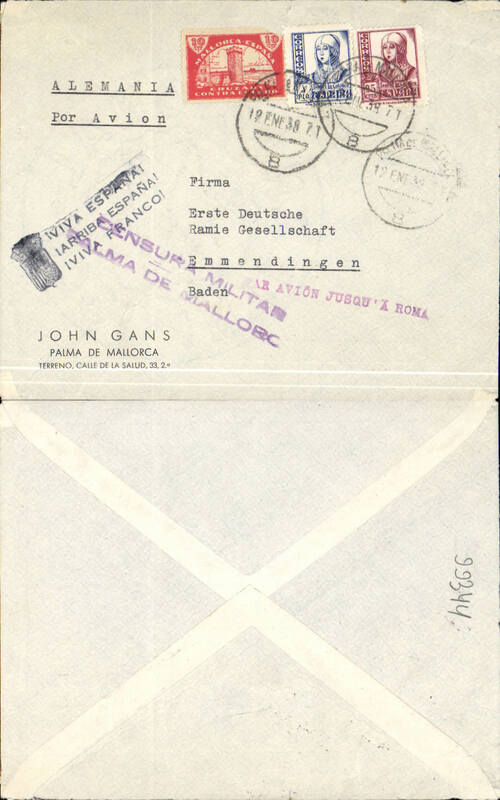 Censored Spanish Civil War airmail, Palma Majorca to Germany, no arrival ds, plain cover franked 1P35 (foreign letter rate 50c, air fee to Rome 75c, unemployment tax 10c), canc Palma de Mallorca cds, fine strikes x2 red uncommon "Par Avion Jusqu'a Roma" applied in Palma (the airmail etiquette has been removed to Make room for the Jusqu'a cachet), red two line "Censura Militar/Palma de Mallorca" censor mark. Carried on the Ala Littoria Cadiz-Mellila-Mallorca-Rome airmail route serving Nationalist areas of Spain. Nice item. 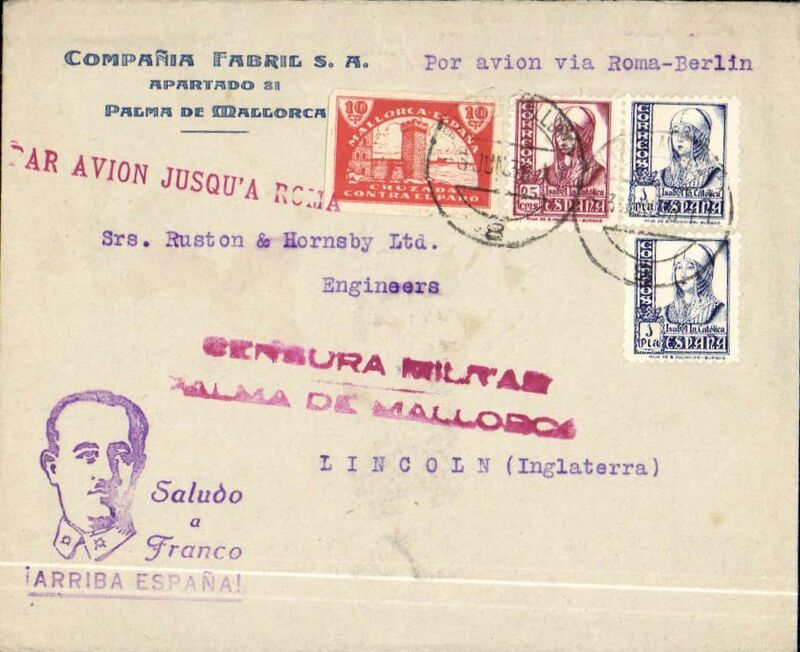 Censored Spanish Civil War airmail, Palma Majorca to England, no arrival ds, commercial corner cover franked 2P35, fine strike red uncommon "Par Avion Jusqu'a Roma" applied in Palma, red two line "Censura Militar/Palma de Mallorca" censor mark, violet "Saludo a Franco/Arriba Espana" propaganda hs. Great Britain had no official postal relationship with the Nationalist (Franco) government and, hence, with Palma de Mallorca. But those in the know used the Italian Ala Littoria seaplane Cadiz-Mellila-Mallorca-Rome airmail route serving Nationalist areas of Spain. 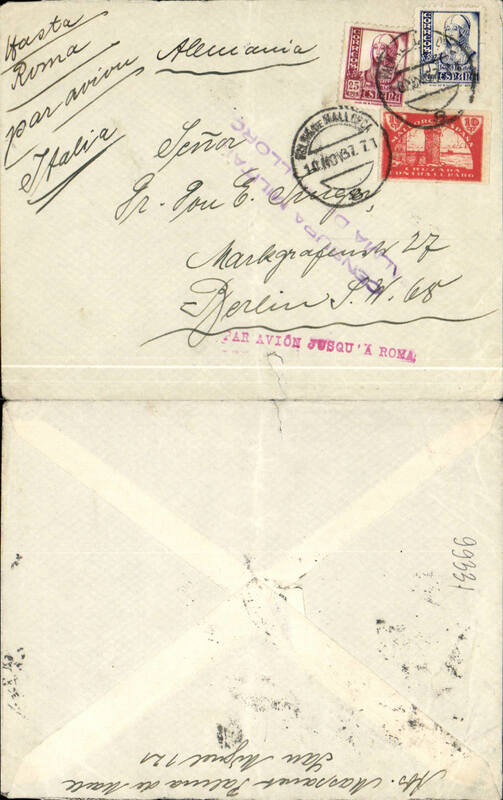 Censored Spanish Civil War airmail, Palma Majorca to Germany, no arrival ds, plain cover franked 1P35 (foreign letter rate 50c, air fee to Rome 75c, unemployment tax 10c), canc Palma de Mallorca cds, fine strike red uncommon "Par Avion Jusqu'a Roma" applied in Palma, red two line "Censura Militar/Palma de Mallorca" censor mark. Carried on the Ala Littoria Cadiz-Mellila-Mallorca-Rome airmail route serving Nationalist areas of Spain. Nice item. 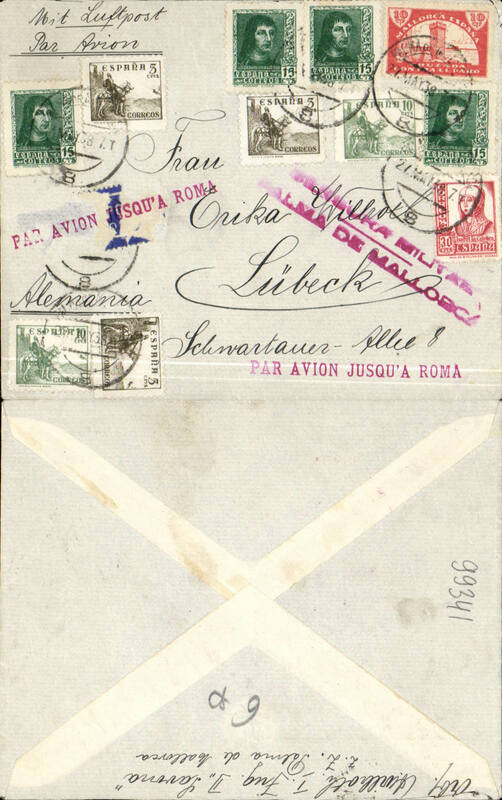 Censored Spanish Civil War airmail, Palma Majorca to London, no arrival ds, bank corner cover franked 1P35 (foreign letter rate 50c, air fee to Rome 75c, unemployment tax 10c), canc Palma de Mallorca cds, fine strike purple "Par Avion Jusqu'a Roma" x3, purple two line "Censura Militar/Pama de Mallorca" censor mark, large 'Par Avion'hs's x2. Great Britain had no official postal relationship with the Nationalist (Franco) government and, hence, with Palma de Mallorca. But those in the know used the Italian Ala Littoria seaplane Cadiz-Mellila-Mallorca-Rome airmail route serving Nationalist areas of Spain. Censored Spanish Civil War airmail, Palma Majorca to England, no arrival ds, commercial corner cover franked 1P35, fine strike uncommon violet "Par Avion Jusqu'a Roma" applied in Palma, violet two line "Censura Militar/Palma de Mallorca" censor mark, violet "Saludo a Franco/Arriba Espana" propaganda hs. Great Britain had no official postal relationship with the Nationalist (Franco) government and, hence, with Palma de Mallorca. But those in the know used the Italian Ala Littoria seaplane Cadiz-Mellila-Mallorca-Rome airmail route serving Nationalist areas of Spain. 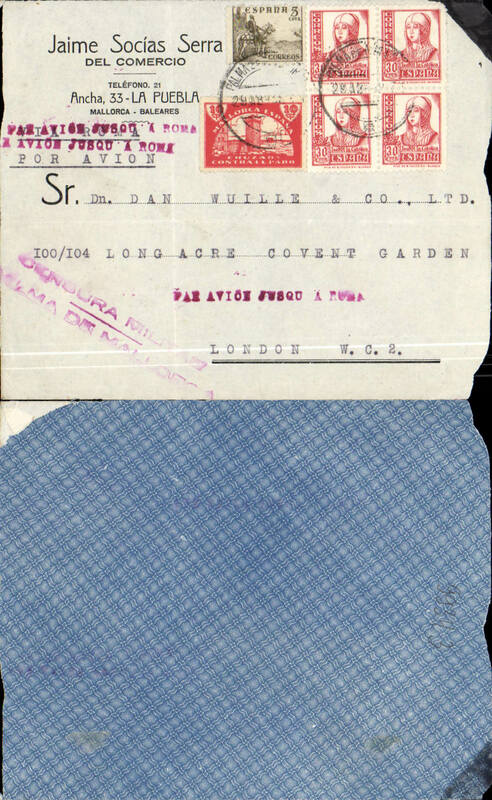 Censored Spanish Civil War airmail, Palma Majorca to London, no arrival ds, plain cover franked 1P35 (foreign letter rate 50c, air fee to Rome 75c, unemployment tax 10c), canc Palma de Mallorca cds, fine strike uncommon purple "Par Avion Jusqu'a Roma" applied in Palma, purple two line "Censura Militar/Palma de Mallorca" censor mark. Great Britain had no official postal relationship with the Nationalist (Franco) government and, hence, with Palma de Mallorca. But those in the know used the Italian Ala Littoria seaplane Cadiz-Mellila-Mallorca-Rome airmail route serving Nationalist areas of Spain. Some rough top edge opening. 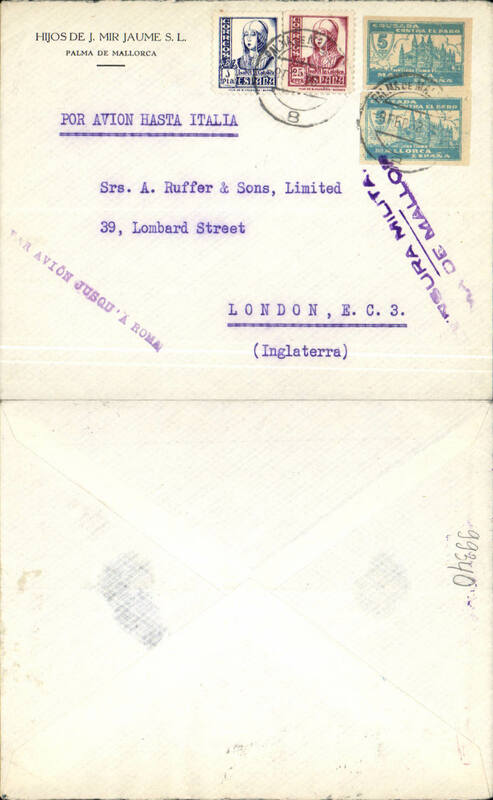 Censored Spanish Civil War airmail, Palma Majorca to England, no arrival ds, plain cover franked 1P35 (foreign letter rate 50c, air fee to Rome 75c, unemployment tax 10c), canc Palma de Mallorca cds, fine strike uncommon purple "Par Avion Jusqu'a Roma" applied in Palma, purple two line "Censura Militar/Palma de Mallorca" censor mark. Great Britain had no official postal relationship with the Nationalist (Franco) government and, hence, with Palma de Mallorca. But those in the know used the Italian Ala Littoria seaplane Cadiz-Mellila-Mallorca-Rome airmail route serving Nationalist areas of Spain.